This bronze relief panel from the Gutenberg Monument in Mainz, Germany, was created by sculptor David d’Angers in 1840. When you make knowledge available to everyone, good things happen. That was one of the attractions of helping to teach English as a Second Language to refugees and other immigrants. Although I decided to take time off to make regular visits to my sister during her cancer treatments, I hope to go back to volunteering before long. Imagine that some of our students couldn’t even read and write in their own language! Opening up doors sure felt important. Back in the 15th century, reading in Europe was limited to a chosen few. If you wanted to know what was in the Bible, for example, you had to take the word of a Latin scholar who had access to handmade manuscripts. There were no books in circulation for ordinary people. Then Johannes Gutenberg had an idea for moveable metal type, and that led eventually to the printing of Bibles in the vernacular. “It heralded a step change in printing technique: whereas earlier forms of printing relied on woodblock technology, the use of moveable metal type allowed more flexible, efficient and cheap printing. The invention of new forms of ink (more like a veneer) enabled crisper and more durable printing. … Printing also enabled accurate, and (mostly) reliable reproduction across a number of volumes. It also meant that any minor mistakes would be reproduced, too. “The printer who mistakenly omitted a vital ‘not’ from the Ten Commandments was vigorously punished by a very bad-tempered Archbishop Laud in 1631. The article History Today, here, emphasizes the effect that Gutenberg’s invention had on the history of religion, but for me as a former publishing person, what’s important is that it enabled the printing of many more books — first in Latin, then in the languages ordinary people spoke — and opened up a new world of knowledge to anyone who was interested. Today only specialist artisans use moveable metal type and much of our reading is not on paper but online, but I hope that hard-copy print never goes completely out of style. It has a value that humanity has yet to fully appreciate. The act of building puppets has long been a form of protest for the Czech people. Never underestimate the power of the arts to affect the course of nations. In this story, puppets kept the Czech language alive during a period of repression by German speakers. Jacklyn Janeksela writes at the BBC, “It was thanks to the humble puppet that the Czech nation – and its language – was inadvertently saved. “When the Protestant court left Prague in the early 1600s, the city fell into decline for almost two centuries. The new ruler, Ferdinand II, did not tolerate non-Catholics, viewing Protestants as a threat to his faith. Czech locals, mostly peasants and working class people, were forced to speak the German language of their invaders. Soon after, intellectuals, who had initially resisted the German language, followed suit. Even Czech actors began to perform in German as an official mandate. Czech became a mere dialect, and would have slipped into oblivion had it not been for some unassuming pieces of wood. “The act of building puppets has long been a form of protest for the Czech people. Seventeenth-Century wood-carvers, who were more versed in sculpting Baroque seats for churches than human facsimiles, started making puppets for the actors of Bohemia soon after Ferdinand II came to power, as puppets were the only remaining entities that had the right to speak Czech in public places. While the rest of the country and its people adhered to the newly imposed German language, wandering actors and puppet-masters spoke through the puppets in their native Slavic tongue. “It might seem unlikely that a few hundred puppets and puppet-masters could safeguard a language, especially through a loophole, but the people’s last remaining legacy to their past was tied to the puppet’s strings. “In the streets, puppeteers make magic happen. I watched a puppet show in a charming cobblestoned square, where the puppet-master wore the velvety cap of a pageboy, pierced by a single plume that swayed along with the puppet’s movements. He used his puppets to beckon bystanders. Melodic medieval music accompanied the dance of a peasant male and young princess, a Czech love story with a plot twist that favours the underdog, the peasant who wins the heart of a far-fetched royal love.” Read more at the BBC, here. With minority languages threatened around the world today, it’s worth remembering that a culture and way of life can be preserved through arts like puppet-making. See also my blog post on the historically important role of shadow puppets in Armenia, here. Puppets have a special place in the hearts of the Czech people. For one thing, they saved the language in the early 1600s when German-speaking rulers prevented everyone but puppets from speaking Czech in public. Albina Ishmasova as Lady Macbeth. As part of a unique collaboration in Kyrgyzstan, director Sarah Berger created three versions of Macbeth using the Kyrgyz language, which she doesn’t speak. Theatrical directors are often up for a challenge, but this challenge takes the cake: directing actors who don’t speak your language in a production of Macbeth. That is what Sarah Berger did in Kyrgyzstan. She writes about it at The Stage. “I recently returned from six weeks in Kyrgyzstan directing the first ever Kyrgyz translation of Macbeth, made from Russian into Kyrgyz, at the Kyrgyz Academic State Theatre in Bishkek. “I worked with 30 Kyrgyz actors who spoke no English. I don’t speak Russian or Kyrgyz. “To add to the mix, I took two British actors with me, Claire Cartwright and Steve Hay, who performed in English with the rest of the cast speaking Kyrgyz. They played Lady Macbeth and Macbeth respectively. There was also a fully Kyrgyz performance that was filmed and screened on state TV. “So I had to deliver three different versions of the production in just over three weeks, as we performed four premieres with the cast variations. “The challenge of that aside, the Kyrgyz state theatre method of working is entirely different to what we’re used to in the UK: the company comprises people who have trained there and are attached to the theatre throughout their working life, which has its advantages and disadvantages. “The advantages are that they practise their craft every day, and are used to working as a company. They are vocally highly trained and easily fill an 800-seat theatre. They are physically grounded and able to experiment with movement and voice. For example, the Witches and Hecate invented a unique style of delivery, incorporating song and dance. “The production itself worked remarkably well given its disparate elements and the lack of rehearsal time. I would recommend the experience of working in such a different arena as it informs our practice.” More. Women of Jad tribe spinning wool in Dunda village, Uttarakhand. Their language belongs to the Tibeto-Burman group of languages and is one of 780 (possibly 850) in India. Here is a heretical thought from someone who loves language: if practically everyone speaks a different language from everyone else, maybe we don’t need language? One must at least ponder the question of whether there is a better way to communicate with others. I’ve no idea what it could be. Even gestures have different meanings in different cultures. There is always a need to communicate, isn’t there? It’s a puzzle. Even English, despite its frequent role as the bridge language Esperanto was meant to be, suffers from so many Orwellian uses of common words today, you can hardly trust it to convey what you mean. These thoughts came to me because of an article by Sunaina Kumar at Atlas Obscura on the amazing array of languages in India alone. “Ganesh Devy was frustrated by this lack of contemporary data, especially the discrepancies he saw in the existing numbers. Since the government wasn’t likely to start on a new survey in the near future, Devy, a former professor of English from the western state of Gujarat, launched the People’s Linguistic Survey of India in 2010. The name refers to the fact that it was the people of the country, and not the government, that embarked on this project. “The challenge of putting a disparate team together with a minuscule budget of 8 million rupees ($1,17,000) — provided by a private trust — to map the languages spoken by 1.3 billion people was enormous. “ ‘My team was not made of linguists, but people who could speak their own language,’ Devy says. ‘We had writers, school teachers, philosophers, social scientists, some linguists. We also had farmers, daily wagers, car drivers, people who had been in and out of jail. They had an intimacy with their language. Even if it was less scientific, it was authentic.’ These volunteers were asked to record data about the languages they spoke, including the history of the language, its grammatical features, and samples of songs and stories. It was chaotic, Devy admits, but he traveled to every corner of the country to train the team and the final product was vetted with academic rigor. “So far, the PLSI has recorded 780 languages in India and 68 scripts. When Devy embarked on the mammoth project, even he did not expect to unearth that many. He says that the PLSI could not report on nearly 80 languages for various reasons, including accessibility of a given region due to remoteness or conflict, which brings the estimated total number of languages closer to 850. “ ‘India has some of the oldest surviving languages,’ says Devy. ‘A language like Tamil has been around for 2,500 years. Some of the tribal languages would be even older. More here, at Atlas Obscura. 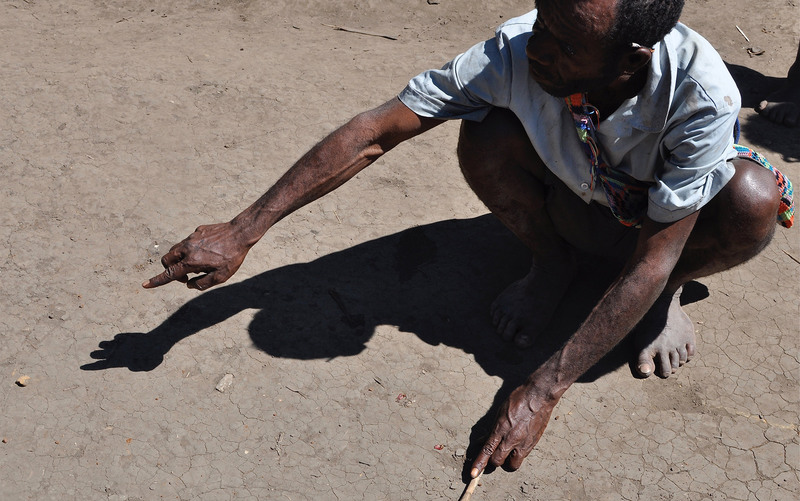 A man in the village of Gua, Papua New Guinea, points while describing a representation of Yupno history. Recent research confirms the long-held hunch that every culture uses hands in communicating. Esperanto was meant to be a bridge between native languages, and I still believe in its potential. But three cheers for languages that don’t need bridges at all. Blogger KerryCan mentioned one universal yesterday: music. Today’s post is about the nearly universal language of gestures — “nearly” because some gestures have wildly different meanings depending upon the culture. “De Vaca is not the first or last explorer to claim successful communication with indigenous peoples through gesture. Similar reports abound. … Sometimes, the messages conveyed were surprisingly sophisticated. If you stay until morning, we will feed you. In that direction, there are goats and pigs of all sizes. The people in that direction eat human flesh. “In every group yet studied, the hands at least occasionally stir and take flight as people talk. We are certainly capable of communicating without these aerialist accompaniments, but our hands tend toward motion. “A second preliminary point is that evidently not all gestures are universal. Most, perhaps all, human communities harbour a storehouse of hand gestures with fixed meanings, which are often called ‘emblems’. Examples of emblems in the English-speaking world include the shhh gesture (an index finger held vertical across the mouth), the peace sign (an outward-facing V made with the index and middle fingers), and the thumbs up. Notoriously, such gestures can lead to confusion or worse. Another emblem, the okay gesture, made by forming a ring with the thumb and index finger, is perfectly benign in the US but a provocation elsewhere. More here. It’s a thoughtful article, and I will only add that if you help immigrants learn English, as I do, the shhh gesture and the thumbs up appear frequently. In fact, teachers and students pantomime pretty much anything that is not easily accessible using Google Translate. A large cache of recently discovered texts offers insight into one of Africa’s oldest written languages. Archaeologists, whether professionals or amateurs like those in a recent post, keep discovering new wonders. They remind us never to make the mistake of thinking that everything has been discovered. Jason Daley writes at Smithsonian magazine, “Archaeologists in Sudan have uncovered a large cache of rare stone inscriptions at the Sedeinga necropolis along the Nile River. 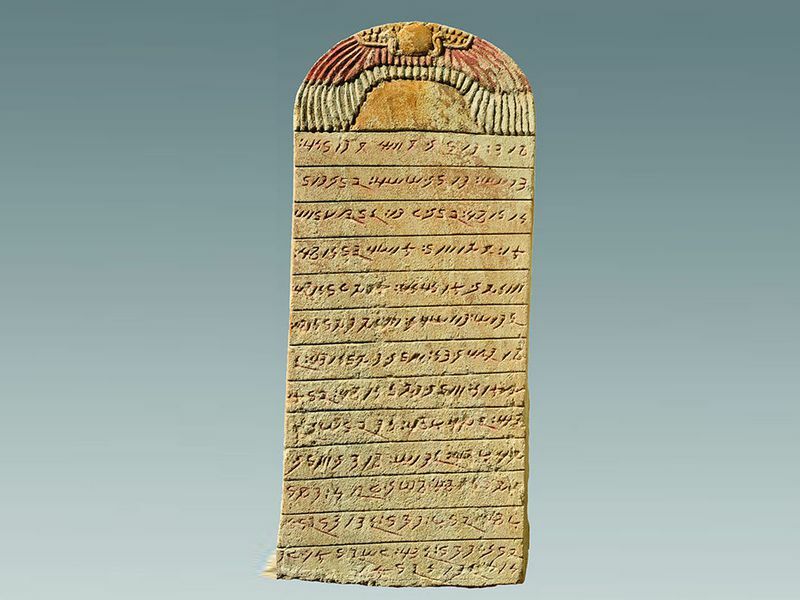 The collection of funerary texts are inscribed in Meroitic, one of Africa’s earliest written languages. “As Charles Q. Choi at LiveScience reports, the find is full of potential. … The archaeological site of Sedeinga — once part of the kingdoms of Napata and Meroe (which were jointly referred to as the ‘Kush kingdom’ by their ancient Egyptian neighbors) –- includes the remains of 80 small brick pyramids and more than 100 tombs created during a cultural period from about 700 B.C. to roughly 300 C.E. “In addition to the funerary texts, archaeologists also found pieces of decorated and inscribed sandstone. … One of the more interesting new finds from the dig is a lintel, or structural beam from a chapel with a depiction of Maat, the Egyptian goddess of order, equity, and peace. This is the first time archaeologists have found a depiction of Maat with black African features. “Another find of note, a funerary stele, describes a high-ranking woman by the name of Lady Maliwarase and details her connections with royalty. Similarly, a lintel uncovered during the excavation explores the lineage of another woman of high rank, Adatalabe, who counts a royal prince among her blood line.